Welcome to MyBinding video. Your name tells the world who you are; announce it with style. 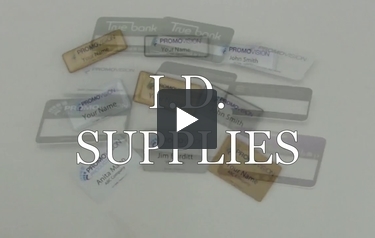 From the simple luggage tag to the sophisticated self-expiring name badge, nobody has a better selection of ID supplies than MyBinding. We have all kinds of magnetic badges, custom printed or slide your name in type. We can even customize transparent pouches and name holders. Click around on our site and you’ll find all kinds of categories that you can choose from. There’s also a help section to help you find the right badge for you. When it comes to clips and attachments, we have every option available. Our many choices allow you to take your specialized lanyard and put a clip on it that you need for your purpose. Whether it is static, detachable, break-away, swivel or badge wheels, we can get it for you, get it fast and customize it to your organization. You’re limited only by your imagination, and our price range is vast. We have people on the phones all day long to answer your questions and customize your order to exactly what you need. So give us a call, click around and order happy. So think to your next event. Do you need to promote it? Do you need it specialized? Whatever it is, we’re here for you. MyBinding.com.